My partner till the end. And know that what you do is right. Yesterday, February 16, 2016, our son Jordan’s dog, Lennon became a young dog once again. She was born on November 30, 2002 in Lexington, KY and within weeks became a vital part of our lives. She lived as Jordan’s loyal and constant companion for the next thirteen years. Her loss has devastated all of us who loved her. Lennon’s health had been failing for the past month despite Jordan’s every effort to help his sweet dog. When she couldn’t walk, he carried all 63 pounds of her. When she was in pain, he made sure her vet gave him the medicine she needed. He watched her shallow breathing many nights without sleeping himself. When she had a seizure, he comforted her and laid beside her on the floor until daylight. Finally, he made the most difficult decision of his life, one that honored her devotion to him over the years. Luther and I were blessed to see Lennon this past weekend. Gone was the puppy who pulled over the Christmas tree that first Christmas. Gone was the dog who would literally chase a tennis ball for as long as you could throw it. 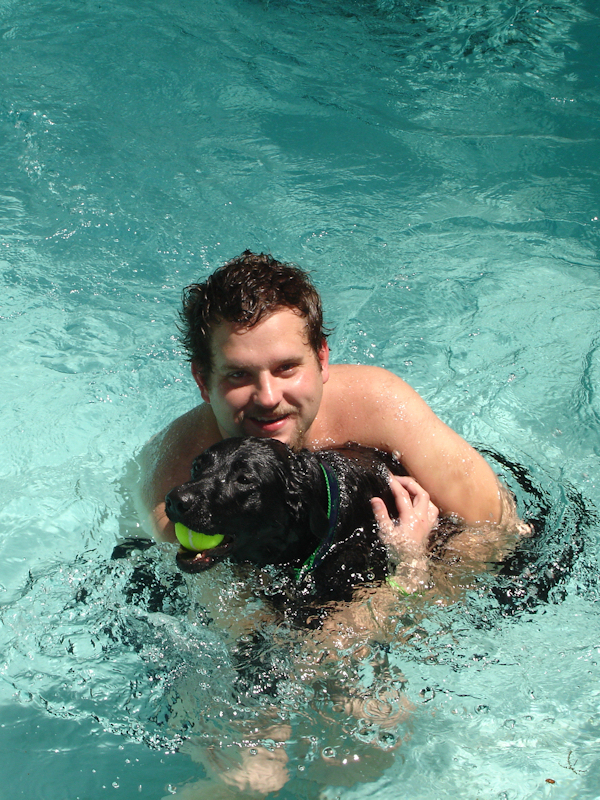 Gone was the dog who could swim for hours. Gone was the dog that would run through a steel door to get to the car if she knew Jordan was leaving. What had never changed was the dog who loved Jordan unconditionally. As I sit here tonight, I am at a loss for words. Hard to imagine I know. How do I describe the loss I am feeling? More importantly, how do I comfort Jordan who has lost his best friend? I feel Lennon’s spirit telling me to stay in touch with her buddy, telling me to let him know she is still beside him and always will be. We love you Lennon. I know Hootie, Hayley, Coco, Gunner, Ebby, Sasha, Elkie, Molly, Corey and McKeever welcomed you when you passed over. I hope they have enough tennis balls for all of you. You graced our lives and we will love you until we see you again.